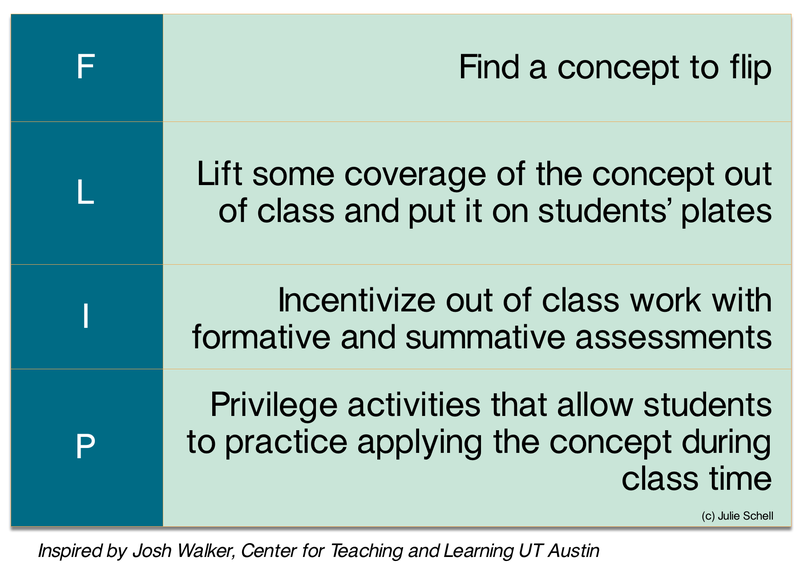 Contrary to popular belief, there is actually no “ONE way to flip a class” (Bergmann, 2012). However, after visiting flipped classrooms all over North America and talking with lots of teachers who have tried flipping across the globe, I have come to view the cycle of flipping as occurring through a common approach. Below, I synthesized this basic cycle into 4 best-practice steps. While there is certainly more to the method than this distillation acknowledges, I hope the sticky acronym can serve as a quick, simplified FLIP guide– whether you are using a Flipped 101 model (e.g. putting lecture videos online and having students do homework in class, see Bergmann and Sams, 2012) or you are using more innovative approaches, such as Peer Instruction. Special thanks and attribution to Josh Walker for the inspiration for this visual. Great concept when everyone is on board. Fliiped instruction works very well with mature students. That said, a simplified version can be worked out by a teacher for younger students based on the learners’ population skills and interests. The flipped approach seems interesting when there is a lack of instructors or facilities. Does the flipped classroom work for younger students? i.e. Pre-Primary, Year 1 and Year 2. I don’t have much experience with the little ones (pre-school and kindergarden) – but I could definitely see having them watch a video that addresses a key concept – “sharing”- or having you read them a story covering that concept in-class and then having them do an application exercise on it. I think it would be amazing! Let me know if you give it a go. Hi Julie. I’d like to use your image in a blog post I’m writing about a flipped classroom initiative at our university. The blog is at learntechgalway.blogspot.com. I will, of course, link back to this blog post and include the attribution. I hope this is ok with you.